Moto G, the most liking brand name by youth, coming now with its third generation smartphone series name Moto G 3rd Gen.
Have a look at the tech review before you going to purchase it. Advanced IPX7 water resistance, a 13 MP rear camera and a 5 MP front camera, a long-lasting 2470 mAh battery and Android Lollipop. Meet the beautifully crafted Moto G (3rd Gen), the phone that'll always be there for you. With the IPX7-rating, the Moto G 3rd Gen is water resistant* enough to handle splashes and accidental drops in water. *Designed to withstand immersion in up to 3 feet of fresh water for up to 30 minutes provided the back cover is properly sealed. Not designed to work while submerged underwater. Do not use while swimming, or subject it to pressurized streams of water. Not dustproof. See Motorola.in for details. The Moto G 3rd Gen features a 13 MP rear camera and a 5 MP front camera. With features such as an ultra-fast f2.0 lens, a color-balancing dual LED flash and HDR, you get perfectly exposed and true-to-life images even in low lighting conditions. The Moto G 3rd Gen comes with a long-lasting 2470 mAh battery* which packs enough juice to last an entire day. Play games, browse the web and listen to music all day without worrying about your phone's battery draining out. *All battery life claims are approximate and based on an average user profile that includes both usage and standby. Actual battery performance will vary and depends on signal strength, network configuration, features selected, and voice, data, operating temperature and other application usage patterns. 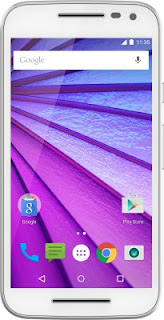 The Moto G (3rd Gen) boasts a 1.4 GHz Quad-core Qualcomm Snapdragon 410 processor, 2 GB RAM and advanced Adreno graphics. Switch between your favourite apps quickly, enjoy flawless gaming and stream HD videos seamlessly on this Moto smartphone. Stream music, browse the web, play online games and watch videos in a flash, thanks to 4G LTE connectivity. A 12.7 cm (5) HD display complements the sleek and stylish design of this Moto smartphone. Immerse yourself in vivid colors and sharp details while viewing photos, watching videos and playing games. Corning Gorilla Glass 3 spans your Moto G from nearly end-to-end, protecting your phone from scratches and accidental scrapes. This phone comes with 16 GB internal storage which can be expanded to an additional 32 GB using a microSD card.